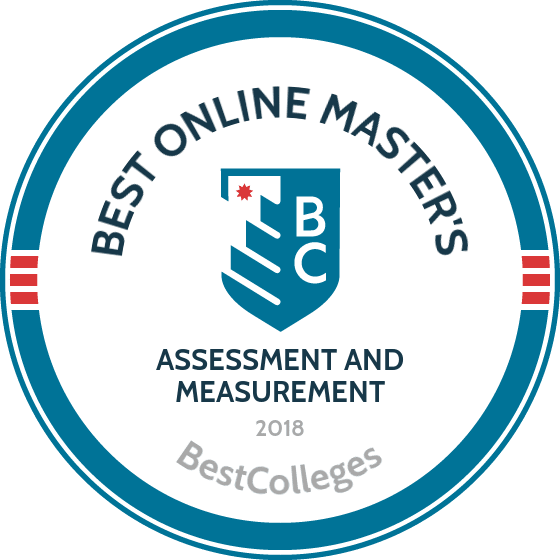 WHAT ARE THE BEST ONLINE MASTER'S IN ASSESSMENT & MEASUREMENT PROGRAMS? What Else can I Expect from an Online Master's in Assessment & Measurement Program? Educational assessment is the ideal field for professionals with a background in education who want to increase their career options. Instructional coordinators and other assessment professionals develop curricula and policies at every level of education, from early childhood learning centers to universities. With instructional coordinator jobs growing steadily, employers increasingly prefer individuals with advanced degrees. Earning a master's in educational assessment will set you apart from the competition. While course offerings and core curricula vary by school, some concepts are integral to any online MEd in assessment program. Most online master's in educational assessment programs include the courses below. Teaching and learning: Designed to provide future teachers with a solid foundation in methodology and best practices, this course introduces the most widely recognized and effective approaches to teaching. Students explore the learning process and learn to utilize technology to enhance the learning experience. Curriculum design: Expanding on core pedagogical concepts, this course teaches prospective educators to create effective and accessible academic “contracts” by constructing engaging course plans. Topics include assessment methods, developing course objectives, and creating assignments that align with course goals and desired outcomes. Technology and education: Students learn to use classroom technology and incorporate media into everyday lessons. Intended for future librarians and teachers, this course covers methods to engage students and cultivate the desire to learn. How Long Does it Take to get an Online Master's in Assessment & Measurement? While most programs take two years or less to complete, an online MEd in assessment program may take longer to complete if a teaching or practicum component is required. However, course structure and pacing most strongly influence completion time. Distance learning programs are often delivered in an individually paced format to provide busy students with maximum flexibility. This type of program allows students to complete assignments according to their schedule, with relaxed deadlines. Cohort-based programs, on the other hand, offer more structure and faculty participation. Students in cohort programs progress through the coursework with a group of peers. Students may be required to log in at specified times, participate in collaborative projects, and meet regular deadlines. An accredited online MEd in assessment program operates according to rigorous academic and ethical standards. Schools may be regionally or nationally accredited. Nationally accredited institutions are typically for-profit trade and vocational schools. Regionally accredited schools are more often nonprofit, academically focused public schools, such as state universities. While credits earned at regionally accredited schools transfer easily, regionally accredited institutions rarely accept credits from nationally accredited schools, which is especially important for students planning to pursue a PhD. Accreditation also affects federal financial aid eligibility. The Department of Education relies on accrediting bodies to determine which institutions are eligible for funding. Quality control groups such as the Council for Higher Education Accreditation (CHEA) ensure that both regional and national accrediting bodies are held to high standards. CHEA also educates the public on the importance of accreditation and the dangers of degree mills and maintains a database of accredited schools. Earning an online master's in educational assessment opens diverse career opportunities, inside and outside of the classroom. Highly organized individuals who want to help others succeed will flourish in any of the following careers, each common for graduates with a master's in educational assessment. Working alongside other faculty members, these curriculum specialists design, implement, and assess teaching materials. They ensure that lesson plans and curricula are held to the highest standards. Employed by colleges and universities, postsecondary education administrators often coordinate faculty affairs, student life, or admissions. K–12 Principal: Principals create a safe and effective environment for students and faculty by overseeing staff and coordinating school activities, curricula, and special events. Principals create a safe and effective environment for students and faculty by overseeing staff and coordinating school activities, curricula, and special events. While most universities require teachers to have a PhD, many community colleges and technical schools hire educators who hold a master's degree. A postsecondary teacher's duties vary considerably by institution. Like instructional coordinators, training and development managers design and implement teaching programs. However, they work in a corporate environment, creating effective methods of training employees. While earning an online master's in educational assessment leads to higher salaries, professional experience, company policies, and geographic location affect earnings. The table below shows instructional coordinators' employment and income by state. There are many options to finance your online master's in educational assessment, including scholarships and work-study programs. Complete the FAFSA to determine your eligibility for federal financial aid, such as grants and loans. Additionally, many private companies and public organizations offer scholarships to students pursuing advanced degrees in education.